This is the fastest dog on Earth, and also one of the world’s oldest breeds. 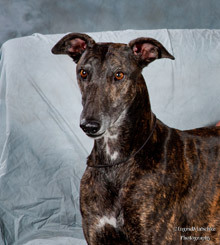 The Greyhound dates back 4000 years and features prominently in the hieroglyphics of the ancient pyramids. The mummified remains of many Greyhounds have been found alongside their former masters in various tombs throughout Egypt. The Greyhound is considered a sight hound, that is, a hunting dog that relies on its sight to chase game over open country known as coursing. Generally, Greyhounds live up to 16 years of age but have been know to live longer with the right care. The retired racing greyhound makes an affectionate pet and, contrary to popular belief, is not a highly strung or aggressive dog. They are in fact very docile and very loyal animals. Through regular exposure to people and other dogs, the Greyhound has developed into very loyal and affectionate house pet. Today, the Greyhound adores human contact and many owners will tell you how they are often "shadowed" as they go about their daily routine. The greyhound will get along with most other pets so long as it is given its own space. Its natural instincts may compel it to round up any smaller animals around the home from time to time. With a fine and close coat, the Greyhound requires little in the way of bathing, however a quick brush each day will go a long way towards keeping this dog looking its best. The ears should be checked and cleaned on a weekly basis and the teeth should be checked for any problems that may arise from the soft diet that some racing dogs are raised on. Like most dogs a regular walk is recommended to provide exercise and stimulation for these engaging dogs.